Survivors of ARK: Survival Evolved will have a new challenge to face in the newly released Scorched Earth DLC. 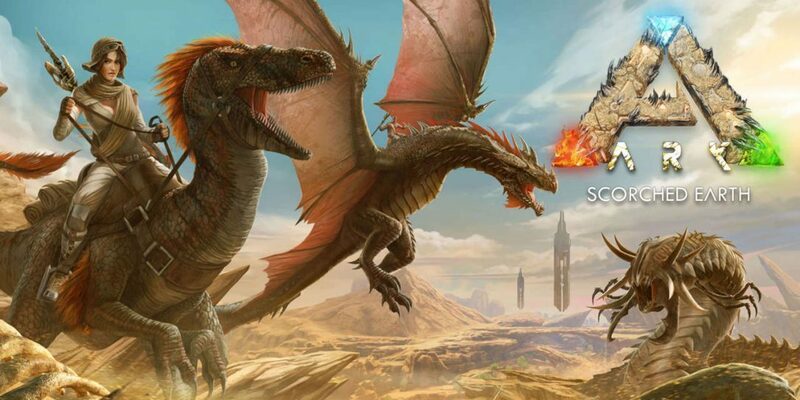 Despite still being listed as “Early Access” on both Steam and XBox, ARK’s first ever expansion has hit the market in the form of a blazing desert map featuring new biomes, creatures, gameplay, and challenges for even the most hearty of survivors. Scorched Earth transports survivors into a desert where they will be constantly challenged by surviving in a landscape with very little water. Traversing across dunes, mountains, canyons, oasis and even a dangerous dragon trench, players will encounter new resources and ecosystems that are full of unique features like ruins, geysers, and even intricate cave systems. Survivors will also have over 50 new items to utilize in their fight against the heat and brutal conditions. Tents, whips, boomerangs, and flamethrowers are just a few of the new craftable items with wind turbines, water wells, and oil refineries are among many of new the mechanics. Players will also be able to travel back and forth between the main island map and the new desert map with all of their items. Studio Wildcard co-founder and lead designer, Jeremy Stieglitz says the travel feature is just the beginning of the ARK world. The new terrain will introduce new challenges for the daring including sandstorms, electrical storms, heat stroke, and a new Obelisk boss creature which is touted to be the deadliest ARK creature yet — the Manticore. Dozens of other new creatures have been added to the Scorched Earth map, of which include vultures, spiny lizards, and wyverns. PAX West attendees can get a special preview of the wyverns in the form of a life-sized, 16 foot replica of the creature, which you can check that out at booth #2109 this weekend. Additionally, players will be able to take their belongings acquired in the desert back to the main island map. ARK: Scorched Earth is a completely finished, polished new expansion pack, which retails for $19.99 on Steam PC/Mac/Linux/SteamOS and Xbox One. To play Scorched Earth, players already must own ARK: Survival Evolved, on sale this week at 40% off the retail price for both Steam and Xbox One. You can read the full press release below.